kineteks - Brian Enos's Forums... Maku mozo! Does anyone know if the DeltaPoint Pro uses the same 4 hole locating pattern as the original DeltaPoint? Light load for 38 Super in a revolver. Wondering if anyone has some starting point suggestions for a light load using 124 & 115 gr MG JHP and something like W-231? Brass is Starline 38 SC & Federal small pistol primers. 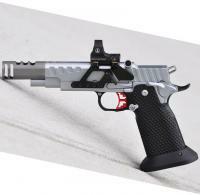 Pistol is a 626 with a 6" barrel sized for .355 dia bullets. I've found some info online ranging anywhere from 4.1 to 5.6 using 231, though 4.1 has me worried about squibs. If I understand correctly these are rounds, once-fired & range pick-up, that you've loaded but not fired so the chamber in your gun isn't a factor (at this point anyway). If the range pick-up brass has a number of reloads on it, was shot out of a poorly supported/over sized chamber barrel or was just loaded REALLY hot.... that may be the source of the more significantly bulged brass. If it's bulged down by the extractor groove nothing but a Case-Pro will straighten that out (in my experience). A quick way to weed them out is to set your digital calipers at ~ .386" or what ever will fit in your case-gauge/chamber and check the cases down by the groove where the die stops. If they won't slide in the calipers toss 'em... that should be fairly quick. How do you remove case lube post loading? Spraying 300-500 cases with One-Shot, I use a plastic tray, takes at most 30 seconds... then I dump it in the case feeder and I'm ready to go. No kidding, you really owe it to yourself to try some One-Shot aerosol it makes a BIG difference in how smooth the press runs and allows better "feel" during de-priming & priming... and everything else. I doubt you'll ever go back to running dry. I use carbide dies too BTW. Regarding the OP's question, I leave the One-Shot on my rounds, it doesn't look as pretty but I've never had a problem with it. That thread was "Finally the perfect open gun optic" and it was locked a while ago. The guy making the sight is/was Jared Drinkwater "jid2" on this site. He has a website/company called Binary Engineering but I haven't seen the sight mentioned anywhere there. I sent him a PM back in December and at that time he was still working on the project, I don't know what's happening with it now. I'm wondering if anyone has had Mark Hartshorne do some work for them in the last 6-8 months? New Starline 38SC and Once Fired Starline Giving Different OAL...? Since the brass length shouldn't affect OAL it may be a difference in case diameter between "fresh" brass and what your sizing die produces (or possibly material hardness). If the unfired brass offers more resistance to the bullet when seating you could be seeing the effect of very slight deflection in the mechanism of your press that doesn't occur with a little less seating force. I often see that that kind of soot with 3n38 at about the same load, no issues so far. For a thread on bulging see http://www.brianenos.com/forums/index.php?showtopic=157732&hl=bulge#entry1764107 I bought a Case-Pro so I could keep my brass in top shape, however with the bulging I described in that thread the Case-Pro has very little to no effect & @ 10+ relaods on new Starline brass I have no feeding or extracting issues. I guess it all depends on how gear-crazy you are and what you can, &/or are willing to, spend on your open gun! I'll admit it, if it's functional, cool and super-high quality... I'll give it a try That said I think most of us are assuming it'll be on the pricey side but not 3x what top of the line optics cost now..... ...so, good point. I concur about the limited value of a patent, at least in my experience.... a super high quality sight, serviceable and continually refined for our specific use would be a no-brainer purchase as far as I'm concerned even if the price was more than any other sight currently on the market. The price would just determine how many of my pistols got to wear one! The design does look awesome and based on other posts I've seen of yours the precision and quality are already there... I would agree with others that it should fit a "standard" mount pattern/placement with only the left side of the frame requiring additional holes. I hope you build them and I, for one, would be willing to pre-pay (even at risk!) to help get the first production run underway. I've been having trouble getting in touch with Mike Calloway/Schuemann Barrels and wondered if anyone had any info that might explain why.